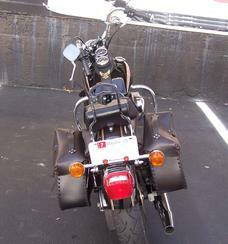 When I spotted this bike in the parking lot of the local Harley dealership , I was drawn to it like a moth to light. Sure I've seen thousands of motorcycles come and go, and I look forward to seeing thousands more. But this one was special. Being a Dyna rider and lover, they have a big spot in my heart, and here was the Grand Daddy of the family, a 1984 FX Low Rider Shovelhead. As I got closer, I really sensed there was something extra ordinary about this bike. It was purity, with just a few minor options and with...brace yourself ...less than 2000 original miles !! I spent a great deal of time looking this bike over and wondering what the story was behind this bike. Here is a prime piece of Harley-Davidson history and it's sitting in the parking lot waiting for its owner to ride on home. I found the owner Laurie and complemented her on the bike and since time was short I invited her to enter the bike in our Battley H-D/GarageBoyz Magazine First Annual Shine Em Up and Line Em up Bike Show. Sure enough a few weeks later she did and was a top 3 trophy winner in the Vintage Class . I finally caught up with her once again and we talked about the 25 year history of her shovel. Laurie has spent the last 30 years in the Navy and this bike has been making the journey with her since 1985 when she bought the bike as it's second owner. The first owner had put 1100 miles on the odometer. The first year of ownership of her bike was a magical time in Laurie's life, serving her residency in Internal Medicine and riding the streets of California.,just a girl and her Harley. She even had her first date with her boyfriend Bob, and Bob being the eager passenger enjoyed their first date on the back of Laurie's Harley . Off they went to the Dunkin' Donuts. Word around town from Bob's friends was " This broad came in with a motorcycle and we never saw Bob again". Over the last 24 years, she has kept Bob and the Harley. The Navy life and circumstances had taken away the time to ride the Shovel, but Laurie stayed on the road on an assortment of other bikes over the years. Despite all of the moving around the country, from California to Florida and to Camp Lejeune to work with the Marines, Laurie stayed true to her love of her first Harley and she brought it with her along the way. Like her other possessions, the military Household Goods move, helped keep them together, whether the bike was in running condition or not. Eventually they made their way to MoCo in 98 and the bike sat in Laurie's basement until August of 2008. Regardless of the fact that she has been running around on her 250 Yamaha, Laurie had been longing to put the Shovel back on the road. It was quite a struggle getting the bike out of that basement 10 years later with its 2 flat tires and a hill standing in the way. But out she came ,and into the capable hands of Jerry Jackman at Jackman Cycles to become road worthy again. 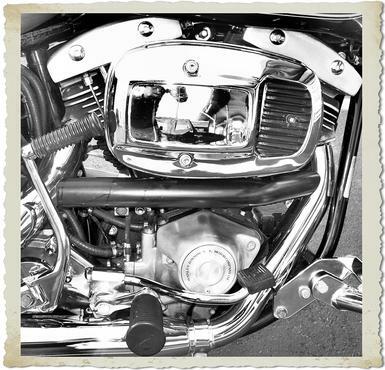 With some TLC and freshening up, Laurie finally had the Low Rider back on the road. She even broke out her original leather jacket from 85. The little time she gets the chance to ride her Shovel are some of her best times on the road. You will never hear her complain about the quirks that come along with owning and maintaining a Shovel. 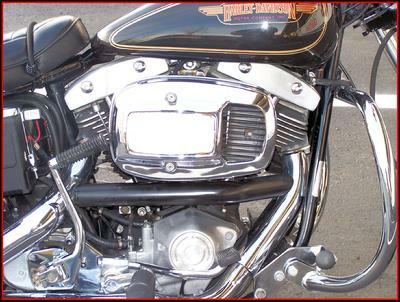 Her heart and history are deeply rooted in this bike and their near 25 years together. It was a real pleasure talking with Laurie and getting to know the story behind this bike. I find it amazing to think that in 1985 when I was still a young aspiring biker in high school ,that Laurie wasn't out just packin on the pillion, she was out ridin' her own bike, this bike. In this day of "newer and bigger is better" and " on to the next thing" consumerism , it is refreshing to see such a level of commitment and dedication to one's machine. I know Laurie is looking forward to retirement and getting more time in the saddle of an old friend. Ride On Laurie.